You are woken up in the middle of the night by the sound of screams. When you go outside you find chaos, people are running from a thick white cloud, one that quickly engulfs you leaving you gasping for air. You try to run, but cannot escape. You are clinging to life. One by one you watch the life disappear from the eyes of your neighbors, your family, and your friends. Their deaths are not painless though, they die choking on the toxic white cloud that has filled their lung. The same gas that has taken their sight and burns their skin is burning you. Quickly, you realize if you do not escape this white cloud you will die, but you do not have time. You have become another victim of the Bhopal Gas tragedy. 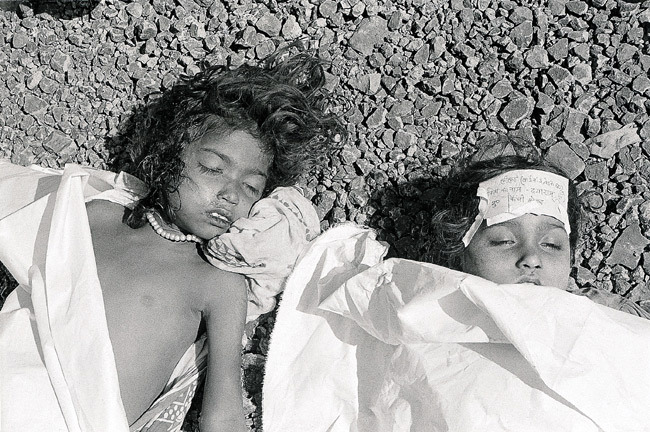 On the night of December 2, 1984 over 22,000 people were gassed to death, 120,000 left critically ill, and thousands of others were poisoned when 30 metric tons of toxic methyl isocyanate gas leaked from the Union Carbide plant in Bhopal, India. Union Carbide was an American based company, who built its factory next to one of Bhopal’s biggest slums. Many speculations can be made about why this location was picked for the factory. Maybe it was cheep land or the close inexpensive labor source, or maybe it was chosen because the people in the slum did not have the voice to fight a big industry and keep toxins out of their backyard. Although the Bhopal Tragedy is known globally as the leading example of corporate violation of human rights, it is not an isolated case. Around the world, marginalized groups are not given a political voice equal to that of their wealthier neighbors. They do not have the political power to fight against the many environmental injustices that face their communities. 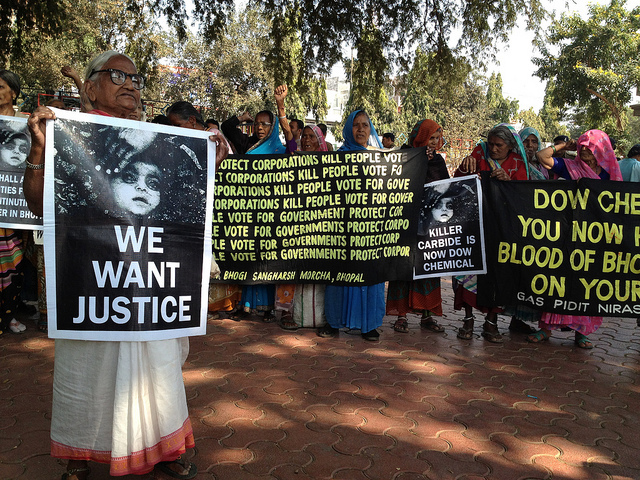 The case of Bhopal is an example of the all too common violation of environmental justice (EJ). Around the world, cases of environmental injustice occur every day. Environmental injustice is the inequality or unequal distribution of environmental risk, behavior, or benefit. The US Environmental Protection Agency defines environmental justice as the fair treatment and meaningful involvement of all people. They say no group should bear a disproportional share of negative effects and the public must be able to influence decisions made on these accounts. Those living in the effected Bhopal slum were both a minority (muslim) and illiterate. When the Union Carbide plant was being built there, no fight could be put up by the residents. Even if they knew about the dangerous chemicals inside the plant, they had no political power to fight back. Not In My Backyard, more commonly known as NIMBY is the ability for people to object to hazardous and unpleasant objects and developments being placed near their residency. Among the wealthy, this power is easily exercised, but among the poor this power is a myth as they do not have the political connections needed to stand up to large corporations. Union Carbide, like so many industries around the world target low income areas for the location for the health hazards which they produce. Those who recognize the patterns that follow these hazards may see it as a form of racism or prejudice, but to those who think nothing of it, the placement of hazards near low income areas may seem normal. To be clear, when companies participate in these practices it is a form of environmental racism; which is the forcing of minorities to bear the major brunt of pollution. Looking at this issue on a global scale, strong correlations can be found between the location of what we call environmental burdens and the ethnic background of the people who feel the most impact from them. Nobody choses where they are born, Birth as my dad calls it is a “womb lottery,” some win and some lose. People around the world who suffer from accounts of environmental injustice have lost this lottery. No, this does not mean that every aspect of their life is miserable, but it does mean they bear burdens that others do not have to due to their ethnicity or socioeconomic status. For the slum dwellers in Bhopal, it was the factory on the outskirts of their home that became a killer; for others, it is the air they breath, the water they drink, or even the ground they walk on. What makes issues of environmental injustice difficult to fight, is the fact that often times proof of human harm is hard to collect. Disease from the injustices can take years to show up often preventing direct correlations to be made. Maybe Bhopal is so memorable because there was a mass casualty; the gas claimed the lives of over 20,000 people that night. Although proper justice was never given to the victims, their story is known. What about those whose illness is not caused by a single catastrophic event, whose sufferings happen over decades or a lifetime? What about those who take years to fall ill, when each passing year makes it harder to point to one true source? Across the world, India has the most documented cases of environmental justice issues as they have 220 of the 1700 documented cases. While most cases spur from the misappropriation of water resources and intense mining projects, India’s capital holds an ongoing case of environmental injustice. Delhi is one of the world’s most polluted cities with an average particulate matter concentration that is over ten times the designated safe limit of a PM 2.5 of 50. With a population of 19 million, half of which live in slums, much of the population is breathing in the highly saturated polluted air without break. While this air pollution is born from a multitude of places, the majority of it comes out of the tailpipes of over 80,000 vehicles on the city streets. So if the major issue in Delhi is found in the air, which everyone has to breath in, how is it a case of environmental injustice? The cars which are major contributors to air pollution are owned by Delhi’s middle to upper class. The same people who own these cars are the people who have windows, doors, and air purifying units to keep pollution out of their homes. 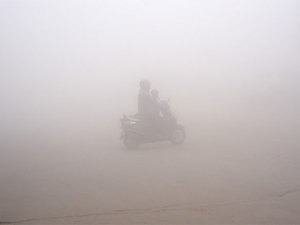 It is Delhi’s poor who bear the brunt of pollution effects, as they never get to escape the polluted air nor do they have the resources to treat health issues caused by the pollution. They are not the ones benefitting from the causes of pollution, but they are the ones bearing the burden that is human health costs. As an outsider, it may be easy to look at cases like Bhopal and Delhi where so many millions of people have been affected and assume cases of environmental injustice do not happen at home. In the US, we often look at tragedies abroad and think that issues like that do not happen in our backyard, but I assure you, they do. Clear examples of environmental racism and cases of environmental injustice are not few and far between. Look to any big city and you will find impoverished communities living in the most polluted areas next to factories, land fills, major highways, or a multitude of other locations. For more concrete examples, look to Flint Michigan, Standing Rock, Love Canal, Hurricane Katrina, the list could go on and on. Duplin, North Carolina is a town that is home to more pigs than humans; in fact there are 40 hogs to every 1 human. The loose regulations associated with hog farming in the US have left those in close proximity to these farms suffering from a plethora of diseases. 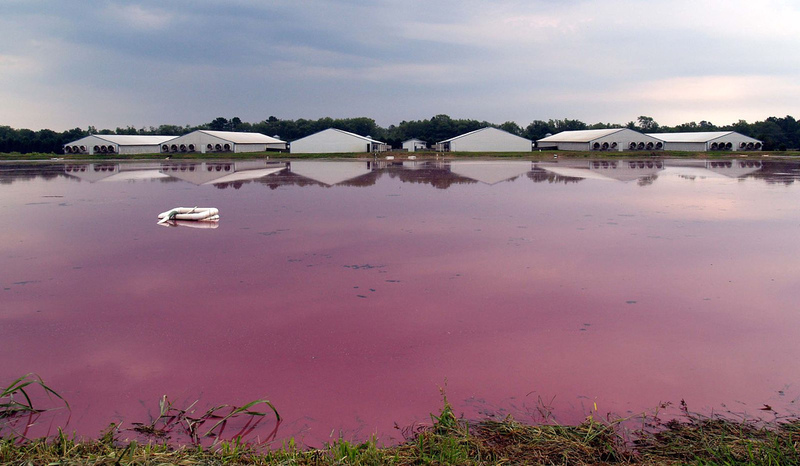 The hog farms not only spray untreated pig feces onto the surrounding land, but they also dump carcasses and other forms of waste into “pink lagoons.” This leaves the air of the city filled with toxins and compromises the water table as chemicals and bacteria from waste lagoons have no barriers to keep them from seeping into the surrounding ground. When looking at the big picture of hog farming in North Carolina, it is minorities that are more likely to live near and suffer from health issues associated with these industrial farms. A study done by the Duke University School of Medicine reported that those who were exposed to the waste from hog farming are more likely to suffer from medical conditions such as acute blood pressure, impaired pulmonary function, asthma, and depression just to name a few. With a median household income of $35,035 USD, the residents of Duplin County are classified as low income by the National Center for Children in Poverty. It is clear that large scale hog farming in North Carolina has taken advantage of those who may not have the means or political voice to stand up to large industry. Wether it be in Bophal, Delhi, or Duplin County, countless case of environmental injustice have occurred around the globe. The catastrophic events have captured the world’s attention, but so many have gone unnoticed. When will industries stop poisoning those who have no voice with their toxins? Until people in power listen to the voices of the marginalized, these cases of environmental injustices will persist, harming those who are given no voice. Johnson, Cindy. (2017) EcoJustice. Lecture, Kristu Jayanti College, 14 November 2017. Udayakumar, S. P. (2017) Env Racism and Green Ethics. Lecture, Kristu Jayanti College, 14 November 2017.